Apert syndrome is one of the craniosynostosis syndromes and is commonly associated with conductive hearing loss, but there are contradicting reports regarding the cause. Retrospective analysis of case notes of Apert syndrome patients seen between 1970 and 2003 was therefore undertaken. Seventy case notes were obtained; 59% were males. The incidence of congenital hearing impairment was 3–6%. Almost all had otitis media with effusion, which tends to persist into adulthood. More than 56% developed permanent low frequency conductive hearing loss by 10–20 years of age. Hearing loss is known to occur in Apert syndrome. Isolated case reports or reports studying only a few patients, seem to contain a high proportion of patients with congenital conductive hearing loss due to ossicular chain fixation.4,5 On the other hand, the two studies involving relatively large samples carried out by McGill (35 patients) and Gould and Caldarelli (17 patients) indicated that otitis media with effusion (OME) is more common than congenital ossicular abnormality.6,7 However, these two studies also seem to show contradicting results with regard to the incidence of congenital hearing loss. Thus the published literature does not clearly show the incidence or the cause of hearing loss seen in Apert syndrome. The aim of this study was therefore to document the type of hearing loss seen in Apert syndrome and its causes. Retrospective analysis of case notes of Apert syndrome patients seen at Great Ormond Street Children’s Hospital between January 1970 and September 2003 was undertaken after obtaining ethical approval. Those patients who did not have any audiological assessment were excluded from the study. An analysis was carried out to find the type, degree, and nature of hearing loss, and whether there was any association between the audiological findings and cleft palate. Serial audiometric results were also analysed to determine if there was fluctuation in the hearing thresholds and whether at least on one occasion normal hearing had been proved (taken as an indication of absence of congenital hearing impairment). In order to determine whether Apert syndrome patients suffered from the long term effects of OME resulting in an acquired hearing loss, only children above the age of 10 were taken into account. All patients in this group where therefore between the age of 10 and 20 years. The degree of this acquired hearing loss was classified into two categories based on the British Society of Audiology guidelines.8 If the average hearing loss in the frequencies of 250 Hz, 500 Hz, 1 KHz, 2 KHz, and 4 KHz were between 20 and 40 dBHL, it was classified as a mild hearing loss. However if the average hearing loss was between 41 and 70 dBHL, it was classified as moderate hearing loss. Of the 82 identified patients, 74 case notes were available from the medical records department. Four had to be excluded as these children did not have any audiological findings in their case notes. Seventy case notes were therefore taken up for the study (largest series analysing hearing loss). The oldest patient included in the study was born in 1971 and the youngest was born in 2003. Most patients are followed up at the hospital until the age of about 16 years, as Great Ormond Street Hospital is a children’s hospital. Hence no information is generally available beyond the age of 16 years. Of the 70 patients included in this study, 41 were males (59%) and 29 females (41%). The majority of patients (46 cases) did not have cleft palate, and formed 66% of all the Apert syndrome patients. Serial audiometric analysis showed 57 patients had no congenital hearing impairment (fig 1). Two had persistent conductive hearing impairment even after the insertion of ventilation tubes, and two had sensorineural hearing loss. In nine others, it was not possible to determine whether there was any congenital hearing impairment. 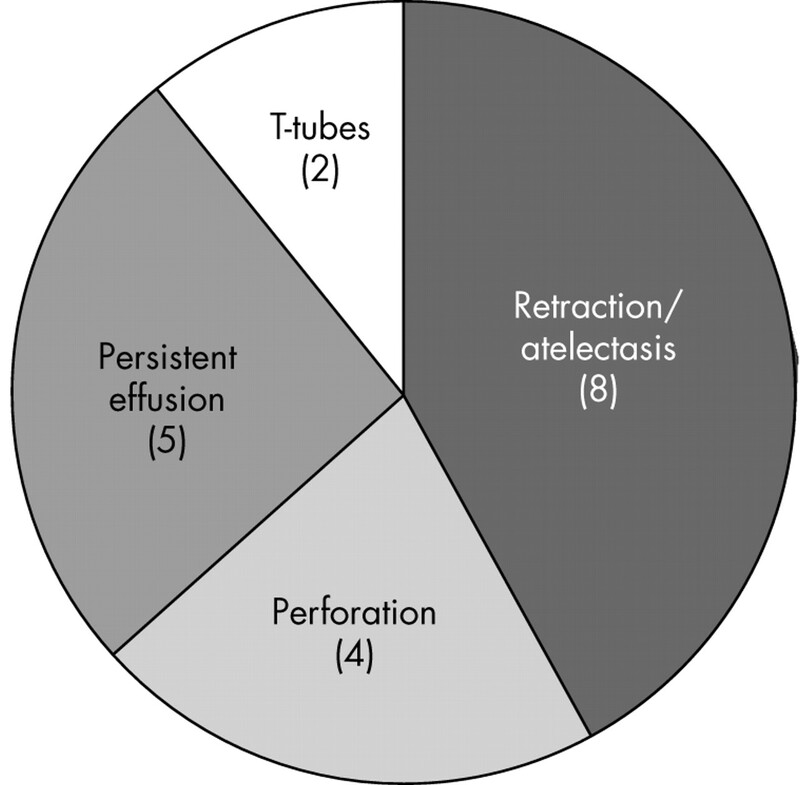 In this study, 65 had documented otitis media with effusion at least once. Only three patients had no documented OME. Information was not available on two other patients. There were 34 patients in the age group of 10–20 years that was used to study the development of acquired hearing loss. Nineteen of them had developed a conductive hearing loss. 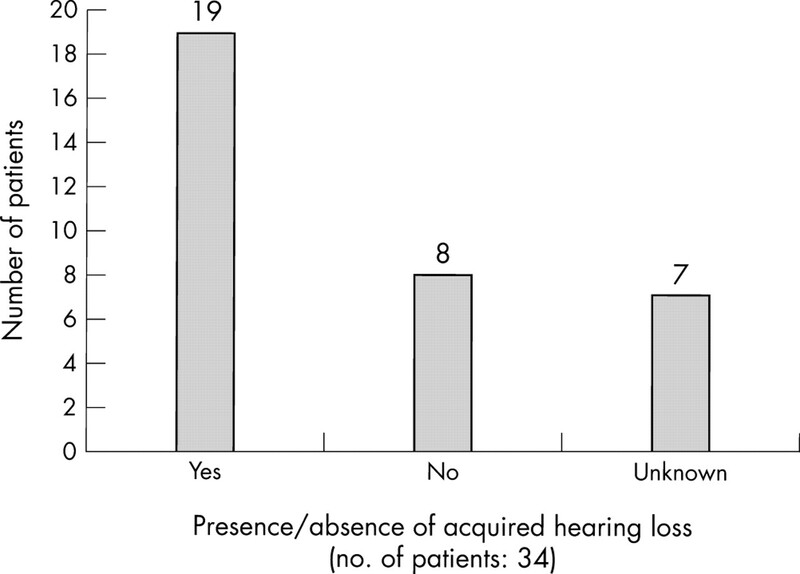 It was not possible to confirm whether there was any residual hearing loss in seven patients (fig 2). The degree of acquired hearing loss was mild in 11 patients (58%) and moderate in eight (42%). Observation of the acquired hearing loss tended to show that the low frequencies (250 Hz, 500 Hz, and 1 KHz) were mainly affected. Number of patients with and without acquired hearing loss (patients over 10 years). The commonest cause of acquired hearing loss was atelectasis/retraction, which was present in eight of the 19 patients with acquired hearing loss. Two of the patients had an in situ T-tube but still had a hearing loss, which would indicate acquired middle ear pathology as they had demonstrated normal hearing previously (fig 3). Causes of acquired hearing loss in patients over 10 years (total number of patients: 19). The incidence of congenital hearing loss has never been established in previous studies. In our study, only two Apert syndrome patients out of 70 had congenital conductive hearing loss, while two others had sensorineural hearing loss. These two patients with sensorineural hearing loss also had other risk factors for developing a hearing loss and it is most likely that the hearing loss is due to those factors, rather than Apert syndrome, as they also had normal radiological findings. Sensorineural hearing loss has not been reported in the literature with regard to Apert syndrome except for isolated reports of mixed hearing loss.9 Thus, it can be concluded that the incidence of congenital hearing loss is between 3% and 6%. Otitis media with effusion is the most important cause of hearing loss in Apert syndrome.5,6 In this study, 65 (93%) children had OME. Three children had no evidence of any OME, but all these three children were below the age of 4 and it is quite likely that they would suffer from OME in the future. It can therefore be said that almost all children with Apert syndrome suffer from otitis media with effusion and it is the most important cause of hearing loss in early childhood. It also shows that presence or absence of cleft palate makes no difference to the risk of development of OME. These findings are similar to that reported by Gould and Caldarelli.7 Otitis media with effusion was seen as early as 1 month of age, and tended to persist into adulthood. Hearing loss in Apert syndrome during early childhood is therefore due to persistent middle ear effusion in most cases. Persistent effusion has consequences and can cause long term hearing loss as a result of sequelae such as adhesions, perforations, and ossicular erosion. In order to study this, only children with Apert syndrome over the age of 10 years were studied. There were thus 34 patients, of whom 19 (56%) showed the effects of OME sequelae and had developed acquired conductive hearing loss. This study is not without its limitations. In addition to it being a retrospective study, it reflects a view from a tertiary centre. Clinical practice would also have been quite variable during the study period, which spanned three decades. Otitis media with effusion is the main cause of hearing loss in Apert syndrome affecting almost all, and tends to be persistent into adulthood. Velar abnormalities make no difference to the risk of development of middle ear effusion and its sequelae. At least 56% develop acquired conductive hearing loss by the age of 10–20 years as a consequence of effusion, and this tends to be mild to moderate, predominantly affecting the lower frequencies. The incidence of congenital hearing loss is low (3–6%). Blank CE. Apert syndrome (a type of acrocephalosyndactyly): observations on a British series of thirty-nine cases. Ann Hum Genet1960;24:151–64. Czeizel AE, Elek C, Susanszky E. Birth prevalence study of Apert syndrome. Am J Med Genet1993;45:392–3. Cohen MM Jr, Kreiborg S, Lammer EJ, et al. Birth prevalence study of the Apert syndrome. Am J Med Genet1992;42:655–9. Phillips SG, Miyamoto RT. 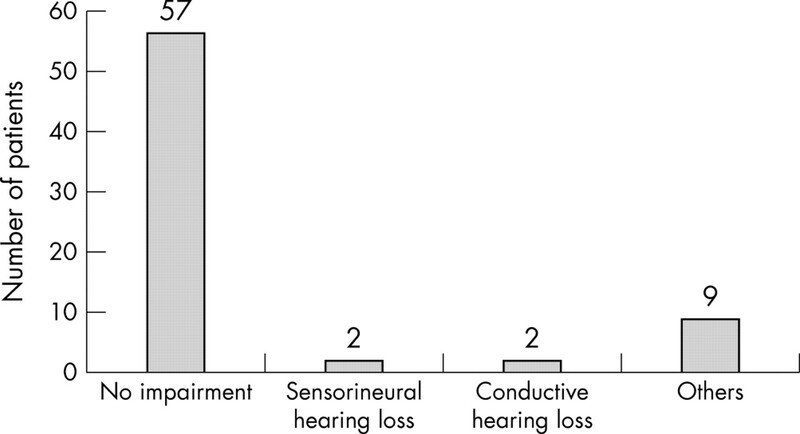 Congenital conductive hearing loss in Apert syndrome. Otolaryngol Head Neck Surg1986;95:429–33. Bergstrom L, Neblett LM, Hemenway WG. Otologic manifestations of acrocephalosyndactyly. Arch Otolaryngol1972;96:117–23. McGill T . Otolaryngologic aspects of Apert syndrome. Clin Plast Surg1991;18:309–13. Gould HJ, Caldarelli DD. Hearing and otopathology in Apert syndrome. Arch Otolaryngol1982;108:347–9. British Society of Audiology. Recommended procedure: Pure tone air and bone conduction threshold audiometry with and without masking and determination of uncomfortable loudness levels. www.thebsa.org.uk/bsapta.doc2004. Huang F, Sweet R, Tewfik TL. Apert syndrome and hearing loss with ear anomalies: a case report and literature review. Int J Pediatr Otorhinolaryngol2004;68:495–501.